There were catastrophic fires in California, devastating floods in the south of France and hurricanes of unprecedented violence. The world as we know it is in danger of changing before our very eyes. However, this reality is less and less present in the political agenda of our governments. The climate is a challenge for civilisation along with the biodiversity or natural resources. Given the shortcomings of the State, the initiative will have to be taken, as far as possible, by the different sectors or by individuals. It is not too late to mitigate the impact of global warming. An awareness of the situation has begun with the successive COPs (Conferences of the Parties). The last of these, COP 24 in Katowice, did not go far enough and there was a lack of urgency. New technologies have emerged, which allow us to have a vision of a cleaner future, and everyone should make use of them. Meanwhile, we continue to irrigate in the hope that we can make our planet greener and more welcoming. 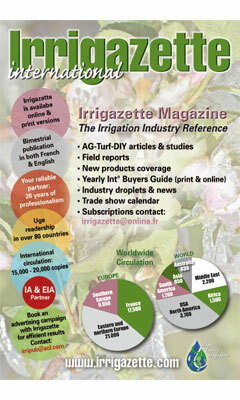 Everyone in the team at Irrigazette wishes you a very Happy New Year.